Before you use this seed you can see all the possible features on the Update Aquatic map. Download it if you do not want to travel and explore the oceans yourself. This seed for the opposing players, for those who love to explore biomes and look for new beautiful places. Here you can visit the crash site of the ship, see colorful corals and find a chest with new treasures. To do this, use the given coordinates in the archive to quickly reach one of these places. 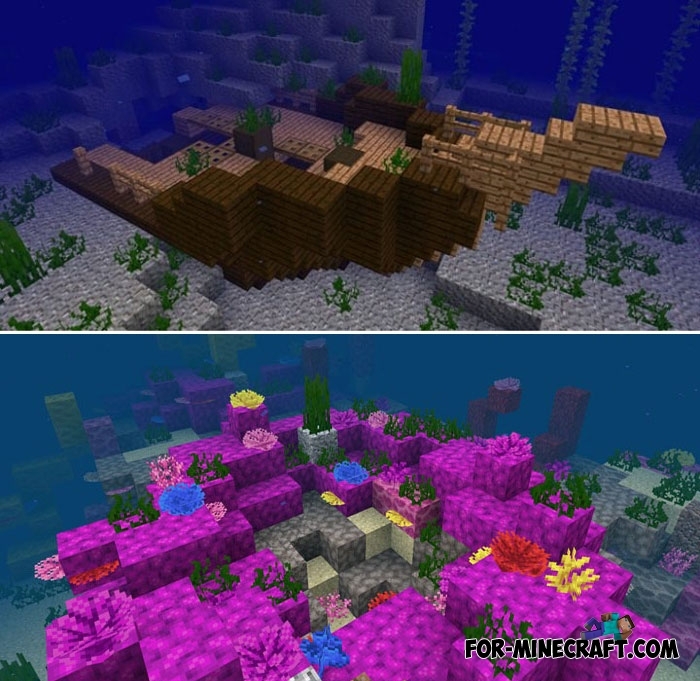 It's not all the features of Minecraft Bedrock 1.2.14, there are icebergs, underwater ravines and other structures generated in different parts of your world. Corals and Fences addon for MCPE 1.2The day is not far off when we will see an update that will bring a lot of new things to the seas, rivers, lakes and oceans..